If you blinked you might have missed it but April 30 was International Pay It Forward Day. It hasn't been a big deal in Australia before, but some companies in the country want to change that. One company aiming to do so was local accounting software vendor, Xero. Around the country this week, Xero has been surprising strangers with random acts of goodwill in the lead up to International Pay It Forward Day. The company worked hard to give people a big boost in Australia by going to small businesses around the country and handing out free coffee, breakfast, haircuts, and more, and encouraging others to pass on the kindness. The concept of 'paying it forward' is essentially performing a random act of kindness for a stranger, and encouraging them to return the favour by paying it forward to somebody else. 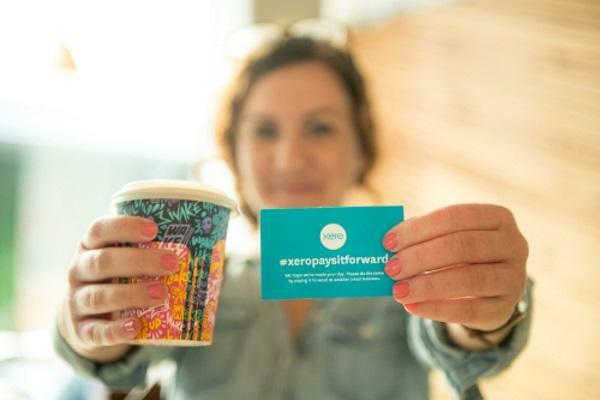 Xero Australia managing director, Chris Ridd, said the company’s staff had been performing random acts of kindness for unsuspecting strangers as International Pay it Forward Day aims to inspire more than three million acts of kindness around the world this year. As an example, Ridd said he shouted coffees for an entire Melbourne cafe, while other staff bought haircuts for strangers at a local barber. “This week has been a great opportunity for Xero to get involved with small businesses at the ground level and encourage our staff to do the same. We’ve seen lots of surprised faces and even some hugs, kisses and emotional reactions from the people that have received a free cup of coffee, lunch or even a haircut. “The project has definitely generated smiles from both the Xero staff and the happy recipients. We are very proud to be leading the initiative in Australia,” he said. Xero will tally up staff contributions and match that amount then donate it all to Australian charity, Youth Off the Streets.